Mortal Kombat inspired a lot of games and stirred many movements for and against violence in videogames. With the new chapter � aptly intitled Mortal Kombat � receiving great reviews, it�s fitting that we have in King of the Streets a fantastic tribute to the franchise created by Midway in 1992.The result is astounding, offering a great freeware PC beat�em up with realistic graphics, even including some winks to Street Fighter in the form of a bonus stage where we have to smash up a car.King of the Streets was surprisingly created not with the Mugen or OpenBor engines, but with Game Maker, by a small indie team of New Zealanders. Curiously, the fighters in King of the Streets (all 8 of them and one boss) are the creators of the game. 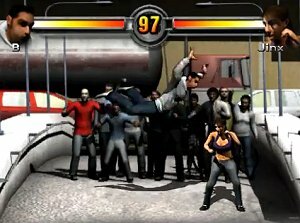 Each fighter even has his/her own story, revealing what motives they have to fight in the King of Streets tournament.King of the Streets offers a very satisfactory gameplay with correct collision detection and smooth animation, and even goes so far as to include multi-level stages, meaning that we can take the fight to other adjacent arenas. There�s blood and you can execute a devastating fatality in your opponent.Fans of fighting games need to try King of the Streets, a surprising entry in the genre and a fantastic tribute to a legendary franchise.